Alberta’s government maintained its mandated oil curtailment in February at the same level as January even as Canadian heavy oil prices surged. The province’s oil producers collectively must cut February output by 325,000 barrels a day, according to an email from Mike McKinnon, an energy ministry spokesman. The baseline for the cuts is the highest single month of production during a one-year period starting Nov. 1, 2017. 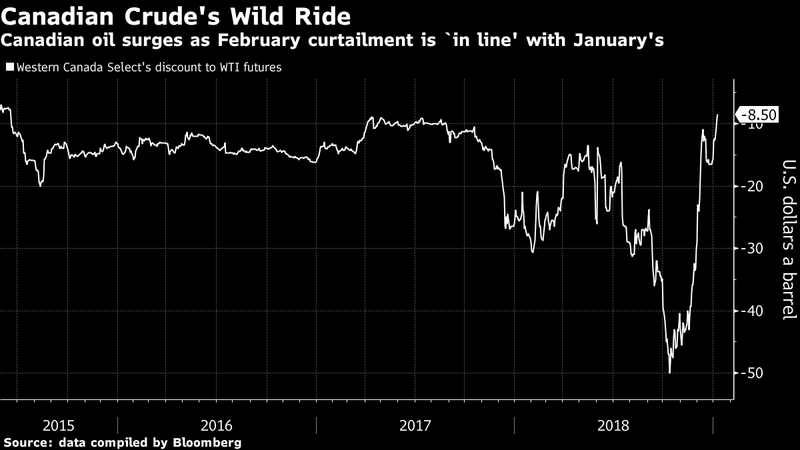 The discount for Western Canadian Select at Hardisty, Alberta, to West Texas Intermediate futures shrank from US$29 a barrel at the end of November to US$7.85 on Thursday, the narrowest in more than three years, data compiled by Bloomberg show. The gap is so small that it doesn’t cover the cost of transporting crude by rail to the U.S. Gulf Coast or, in some cases, by pipeline, a much cheaper mode of transport. “We have seen the market respond quite definitively” to the curtailments, Alberta Premier Rachel Notley told reporters at an event near Edmonton Thursday. “We are planning for a lot of volatility” in oil prices. Notley on Dec. 2 announced the cuts in an effort to alleviate a glut caused by too much production encountering too little space on pipelines. The move was designed to reduce local stockpiles and will be phased out throughout this year to 95,000 barrels a day by Dec. 31, Notley said. At the end of December, Alberta eased the rules around the curtailments starting in February in response to input from oil producers. The revised regulations allow some producers to pump more than would otherwise have been allowed. They also adjusted companies’ baseline production levels so that new projects still in the process of ramping up won’t be adversely affected. Government regulations enable the Alberta Energy Regulator to impose administrative penalties on companies that fail to comply with the curtailment orders, McKinnon said in an email Tuesday. Even with surging prices and a shrinking discount for Canadian crude, crude-by-rail shipments have been rising after companies including Cenovus Energy Inc. signed multi-year contracts to send more oil out on trains. The volume of oil on rail lines rose to a record 296,000 barrels a day in Dec., Genscape Inc. reported on its LinkedIn page.